If you’ve never been to Black Mountain, it’s time to start planning a trip. 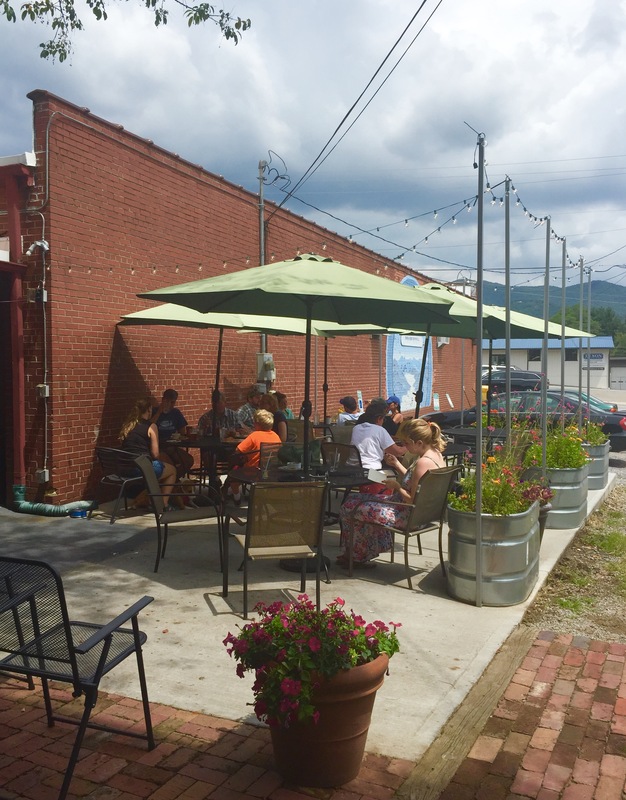 This tiny town is only 15 minutes from Downtown Asheville, so it was hardly out of the way for us to come for brunch last Sunday. 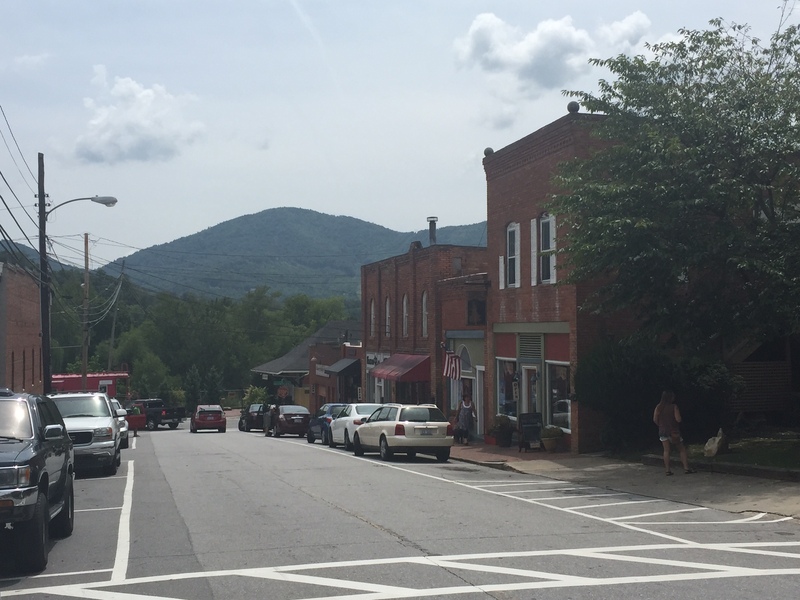 We love this area–it’s about the friendliest place in Western NC, with wonderful shopping and gorgeous views to boot. 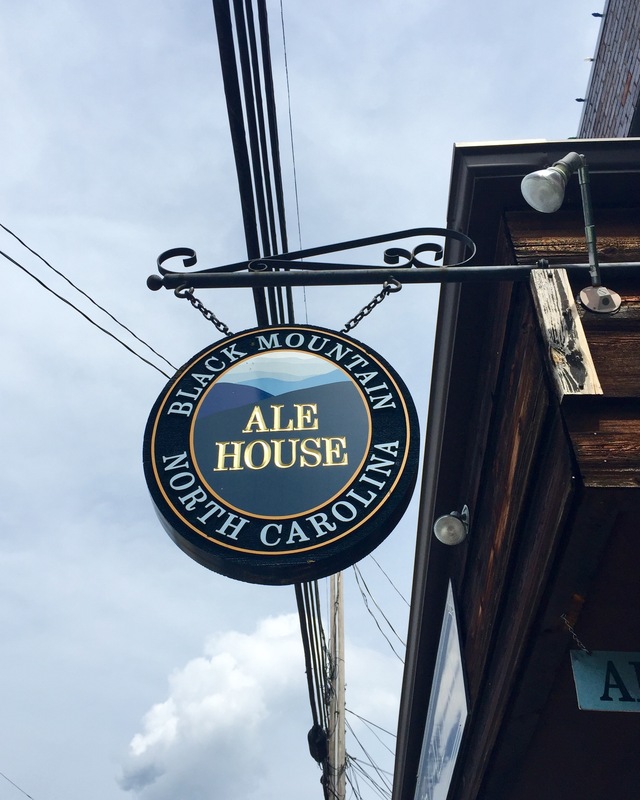 We decided to pay the Black Mountain Ale House a visit. If you have been to Black Mountain before, you’ve surely heard of this place. It’s immensely popular with locals and tourists alike, and for good reason. You’d be pretty hard-pressed to find a better place to spend your morning! It’s located on Cherry Street, but is slightly tucked away so you’ll need to keep an eye out for the signs. Once you’re there, you head down a flight of stairs into the main dining area. The vibe of this place is fun, mellow and friendly. They host cool events all week long, including a Tuesday Trivia Night and a Wednesday Game Night. On any given day, you’ll see regulars at the bar watching a game, families visiting over lunch, and friends laughing in the corner. 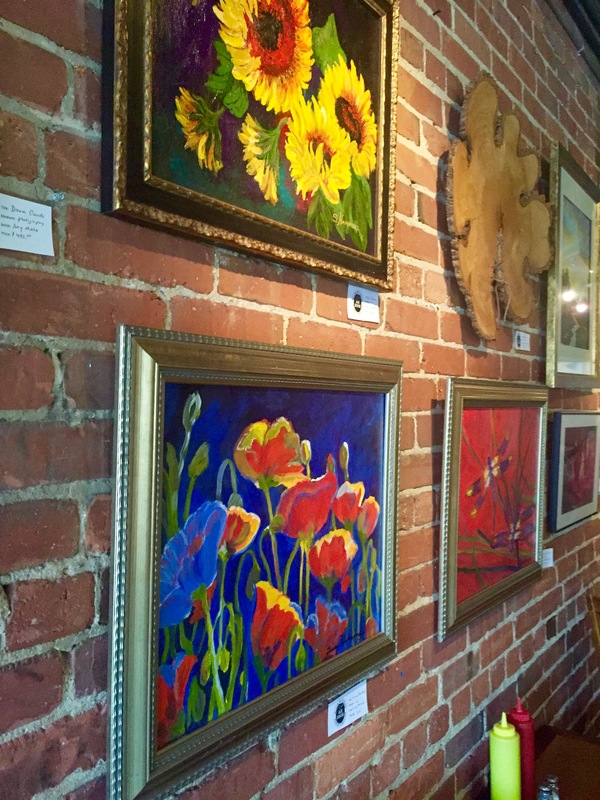 The walls are loaded with cool artwork, and more often than not a local musician is providing the tunes. We decided to sit on the patio and enjoy the breezy summer weather. 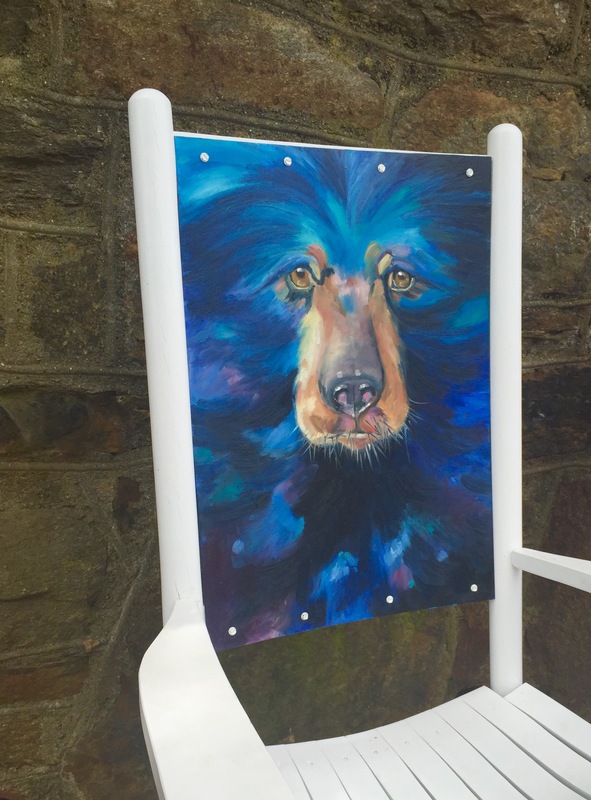 Don’t forget to bring your pup if you have one…this is definitely a dog-friendly spot! Everywhere you look, there is a quirky, carefully considered detail. We had a blast looking around and enjoying the scenery. 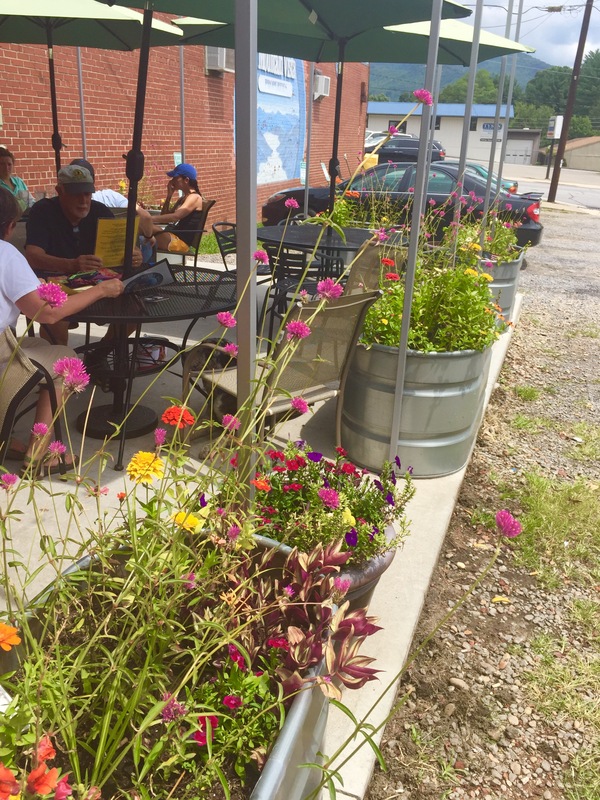 When we asked about The Ale House’s origins, the owner John Richardson responded with a smile: “There was nowhere in town I wanted to take my wife on a date,” he said. “I wanted somewhere nice and upscale, but not pretentious.” Mission accomplished. 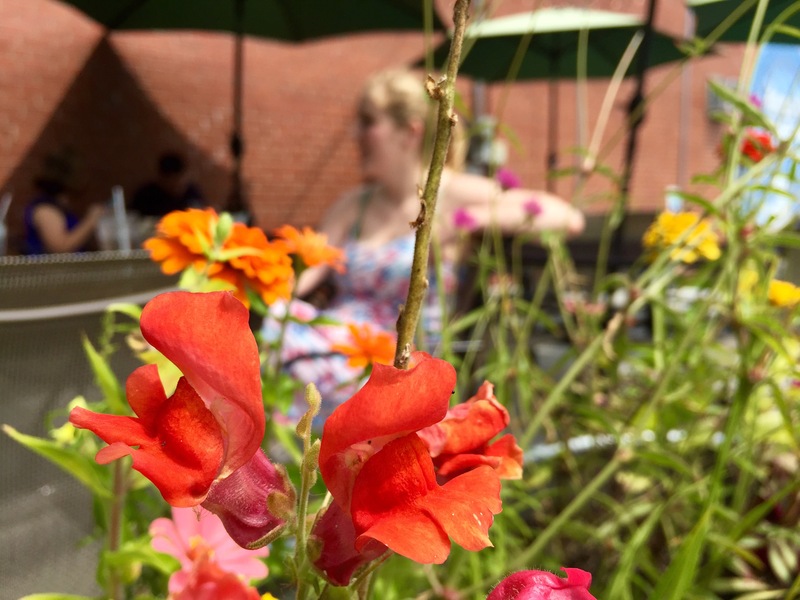 The theme of family pops up everywhere, from the lush patio designed by Richardson’s wife to the warm manner in which the staff greets you. Our server Angel was especially nice and knowledgable. Is there anything better than a good drink – on special – to start your brunch off right? We think not. 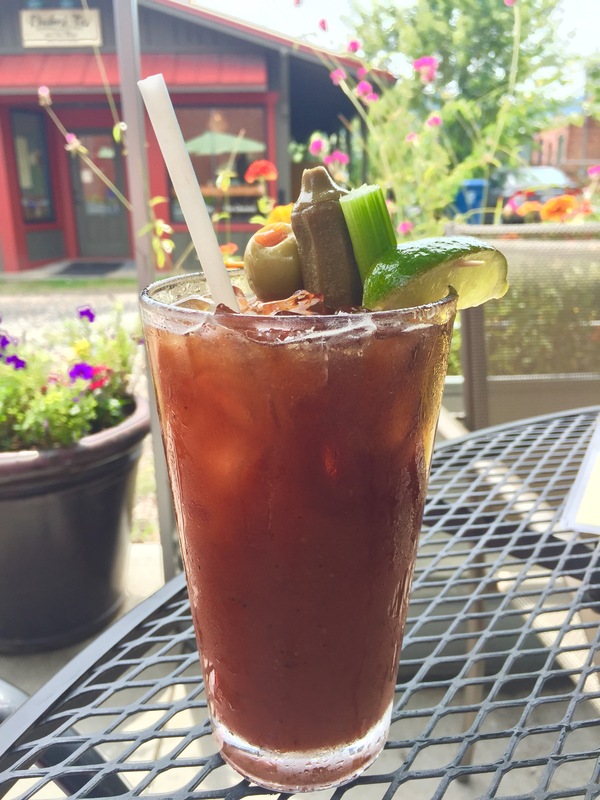 The Ale House offers $3 Mimosa’s and $5 Bloody Mary’s on Sunday. Both were delicious, and we could have had about 10 of each (although better judgement won out in the end). 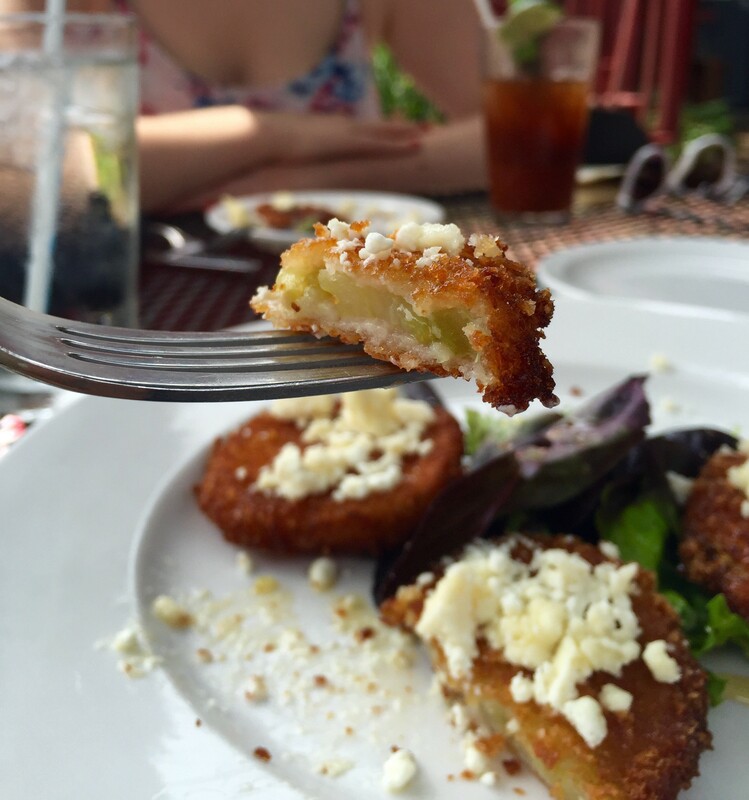 We shared the Fried Green Tomatoes to start. 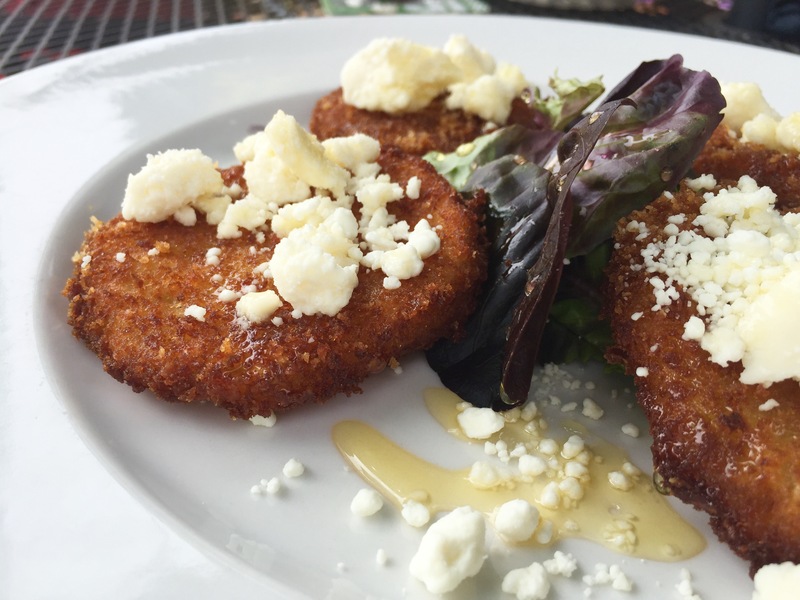 Fried, covered with goat cheese and drizzled with honey, these are not only gorgeous to look at but taste marvelous. Forget about pacing ourselves; we couldn’t get enough of these and devoured them in about two minutes flat. Head Chef Travis Eberhardt definitely put his extensive culinary training to good use in crafting the Ale House menu. Formerly the Executive Sous-Chef at Blackbird, he uses fresh local ingredients, even stopping by the local farmer’s markets when possible. Mattie got the Huevos Rancheros, a house specialty (it’s actually titled Travis’ Famous Huevos Rancheros on the menu). 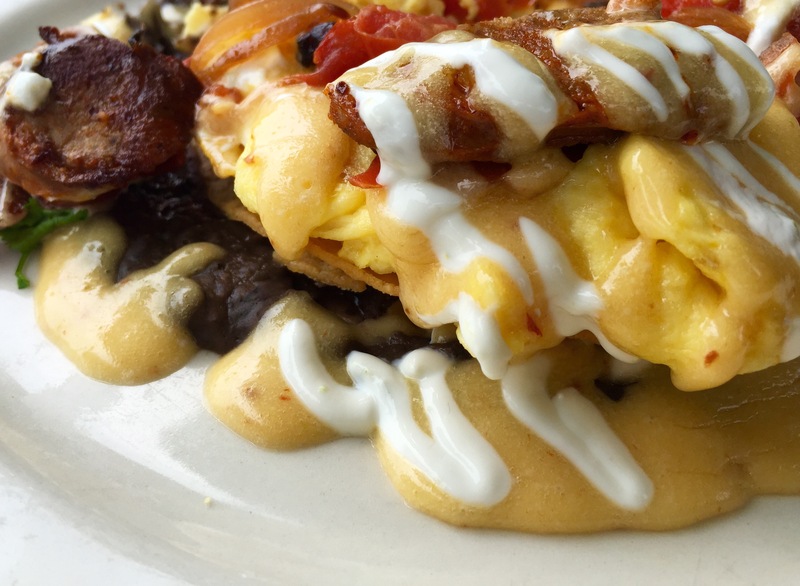 It’s 2 crispy corn tortillas layered with seasoned black beans and topped with eggs (she got scrambled, but they’ll do any style you like), tomato fundido, chipotle hollandaise, queso blanco, chorizo sausage and lime cilantro sour cream. This dish is incredible. It’s so flavorful and the presentation is gorgeous. 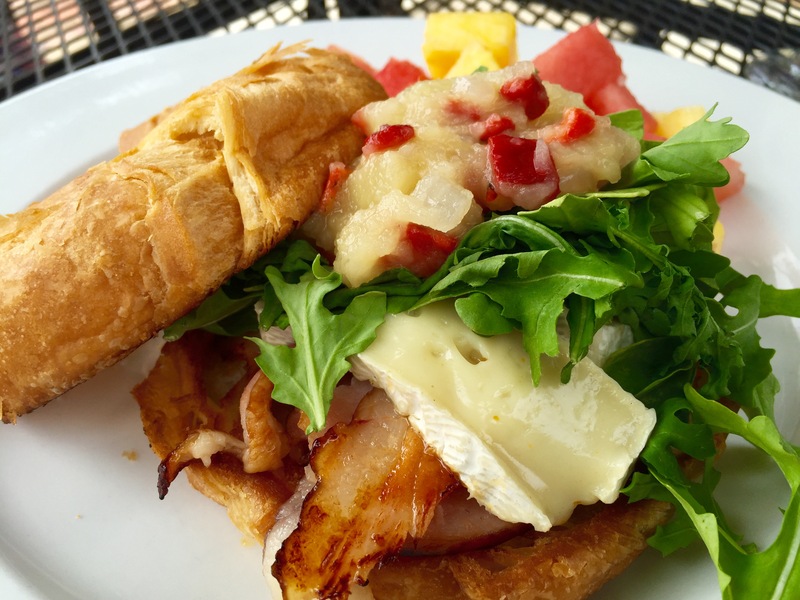 Chelsea picked the Warm Ham & Cheese Croissant, which is sliced pit-style ham served with brie cheese, arugula and apple chutney on a warm, buttery croissant. Chelsea said the ham reminded her of the kind her mother makes for Thanksgiving and Christmas–juicy, thick, and delectable. That being said, it’s hard to say if the ham was the best part of the dish because the apple chutney was really, really, something to write home about. Together, they’re perfection. The Ale House switches up their dessert offerings every few days. 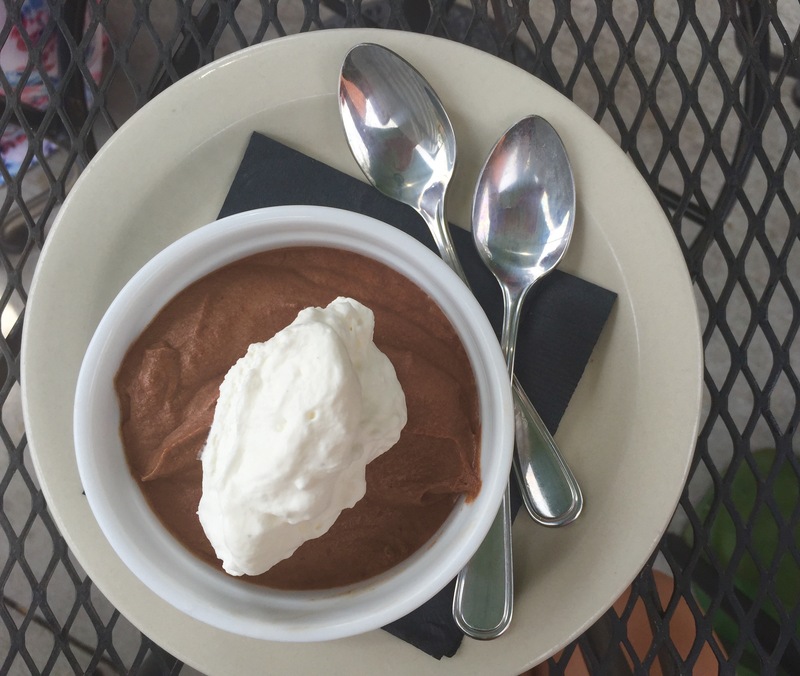 We got the chocolate mousse topped with whipped cream, which was a perfect finish to the meal. It was creamy and rich, but light enough that we didn’t feel too stuffed. After lunch, we took a short stroll around the neighborhood. 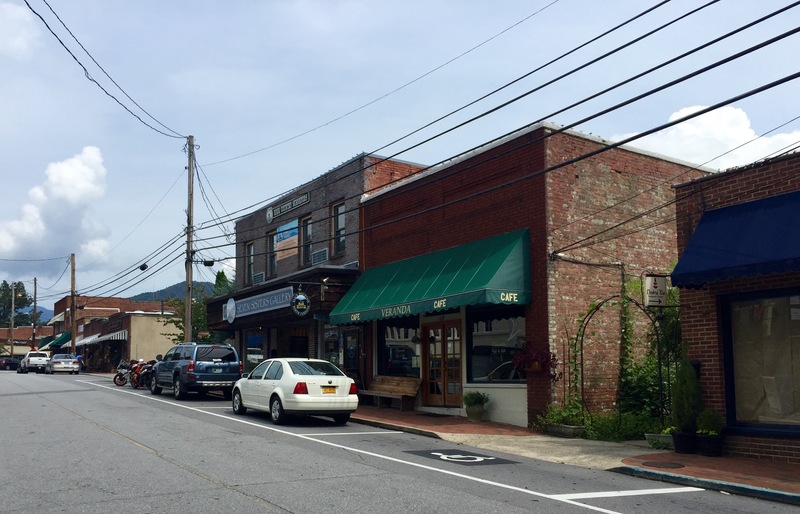 In 2015, Black Mountain started a new campaign, “The Little Town That Rocks”. 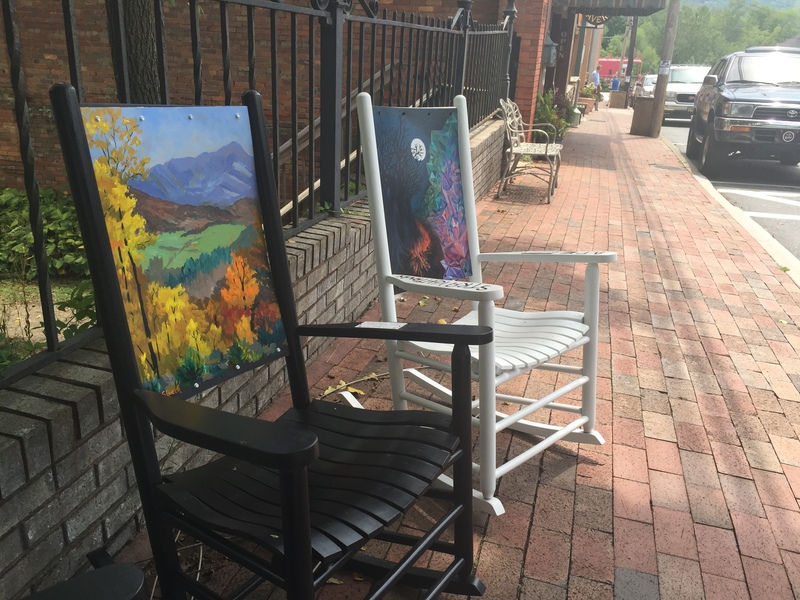 The streets are dotted with gorgeous rocking chairs, hand-painted by local artists. 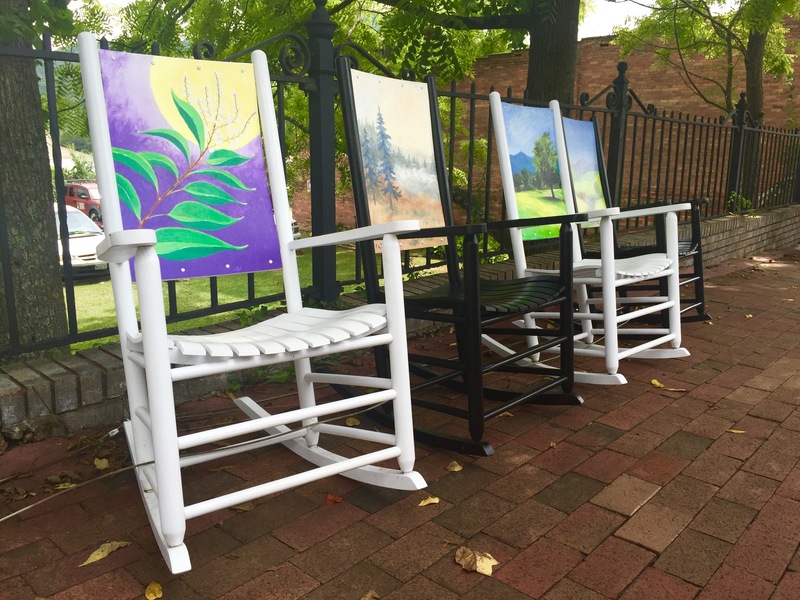 Pick a favorite, sit and stay for awhile. 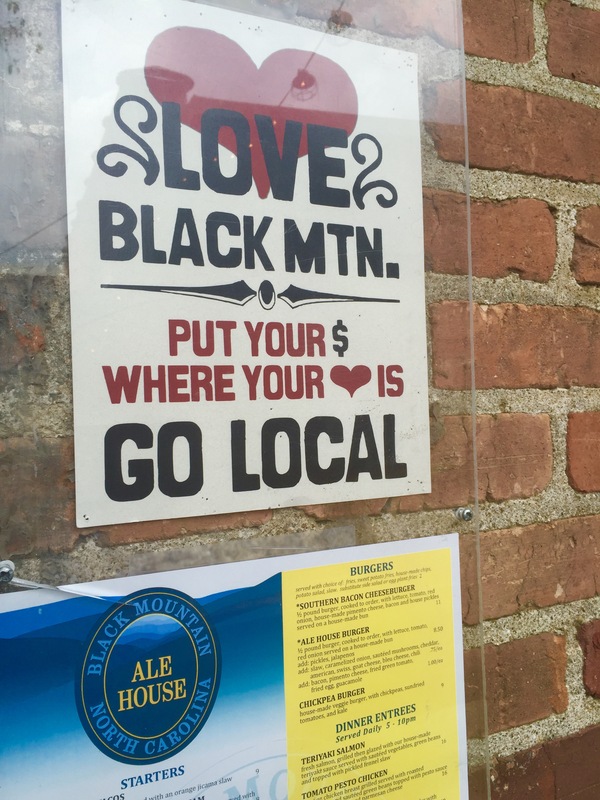 All the love to Black Mountain Ale House. Give it a go next time you’re on the hunt for a good meal–you won’t be disappointed! Wow! This might be your best to date. I never get out to Black Mountain but you’ve got me motivated. Nice work, ladies! Thanks! Glad we sparked your interest…it’s a lovely little town. Let us know what you think after you’ve visited! Your blog motivated me to find a reason to visit Black Mountain … and I did! 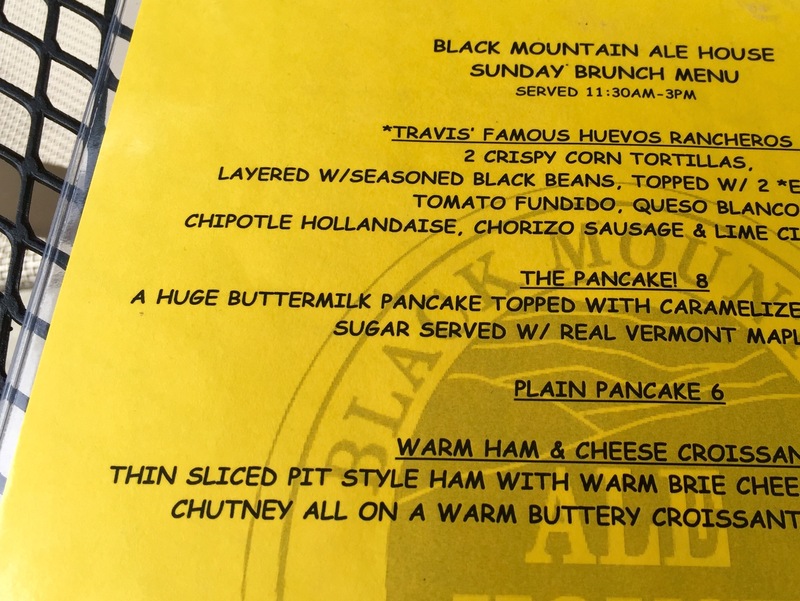 Last week a colleague and I went to dinner at the Black Mountain Ale House and it was just as scrumptious as you described. 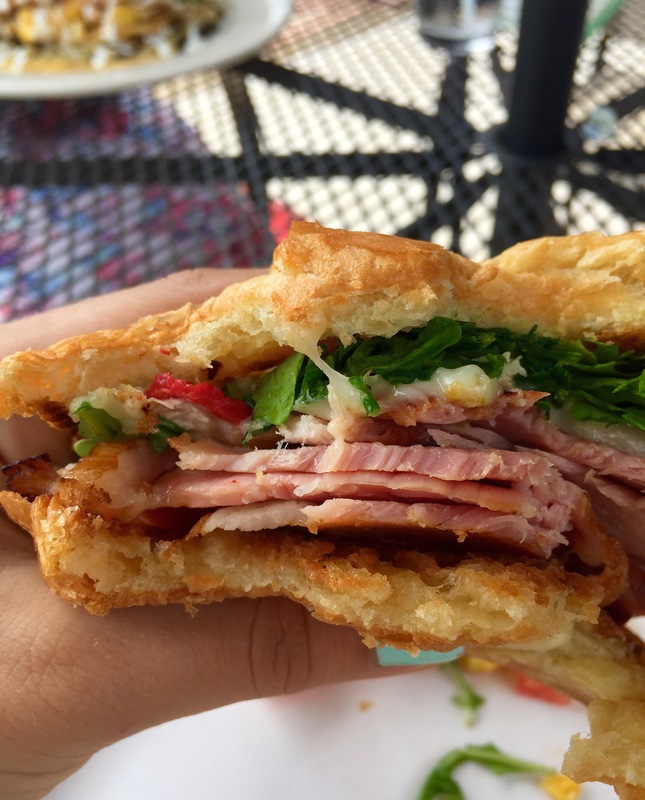 The first thing that caught our eye was the Fried Green Tomato, then the fried Zucchini … then, the sandwiches. Regretfully, we didn’t make it as far as dessert! That will just have to be for another day. Hustle Souls is such a great band! We love hearing them around town. 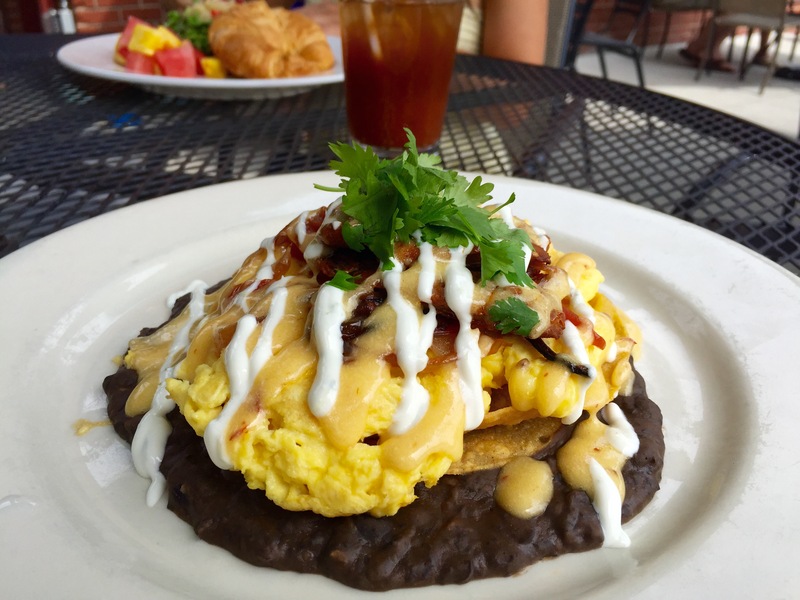 And the Huevos are most certainly reason enough to visit. Thanks for reading! I love going to Black Mountain! It’s such a sweet little escape from Asheville. 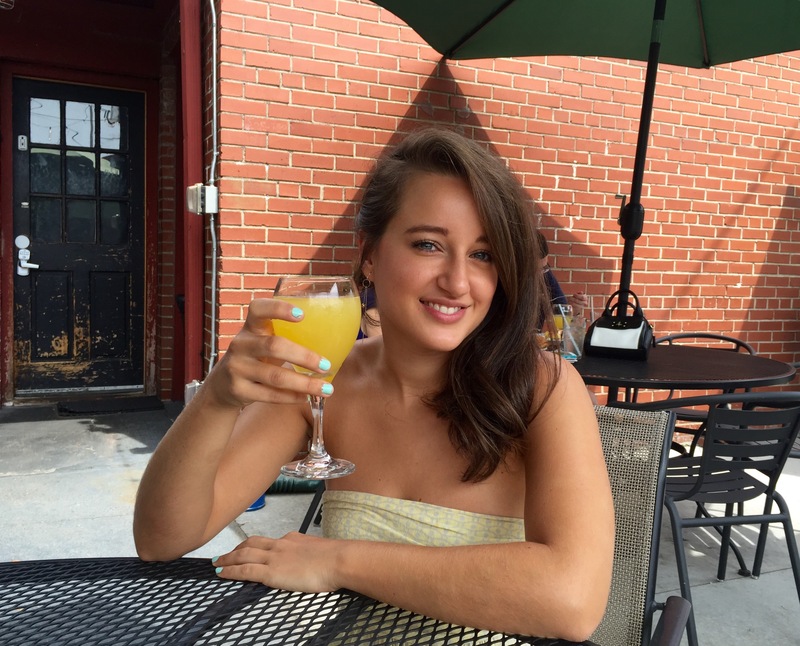 I’ve been to the Ale House for dinner a few times…I had no idea they did a Jazz Brunch! Must give it a try. Keep these coming!!! You two are so cute! I love what you’re doing. This place looks really good–I’ll have to give it a try. Can’t wait to see where you hit up next! 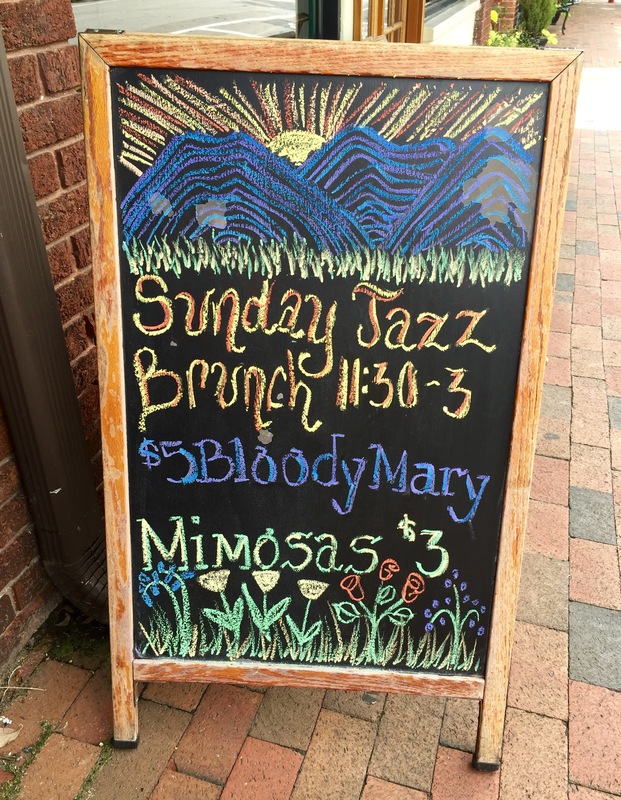 I love Black mountain and went to this restaurant a while back, it’s excellent but didn’t know about Jazz Brunch Sunday or the ham croissant sandwich! 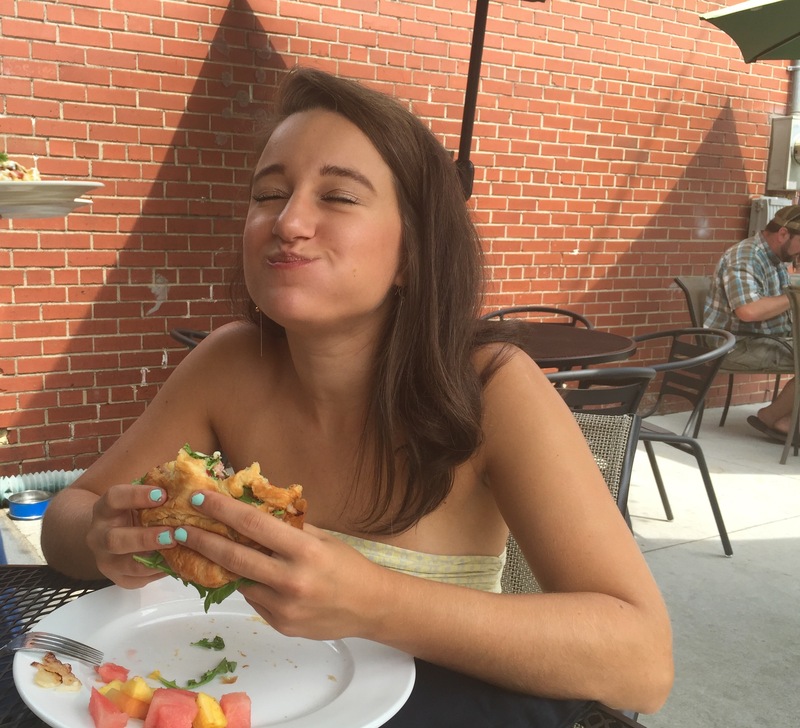 The look on Chelsea’s face says it all… You two are rocking & I check every day for updates. Sadly you must have day jobs that keep you from blogging every day- awesome job! Wow I’m in Asheville and didn’t know black mountain existed. Will check it out for sure. Really like your write ups! The blog on the restaurant excellent- the pics of the food and town with the rocking chairs OMgosh amazing! Can’t wait to check it out! !